Owner Dave Drury at Knopp Taxidermy. Here, against the backdrop of a mural of Mount Kilimanjaro, baboons, monkeys, an African lion, a crested crane, elk, caribou, deer, gemsbok, bosbok, kudu and moose stand motionless on a warehouse floor. There are hundred of hides piled in waist-high mounds and inside boxes with numbered tags. It's only slightly warmer inside the shop, where it reeks of animal hide, fiberglass and tanning oil. 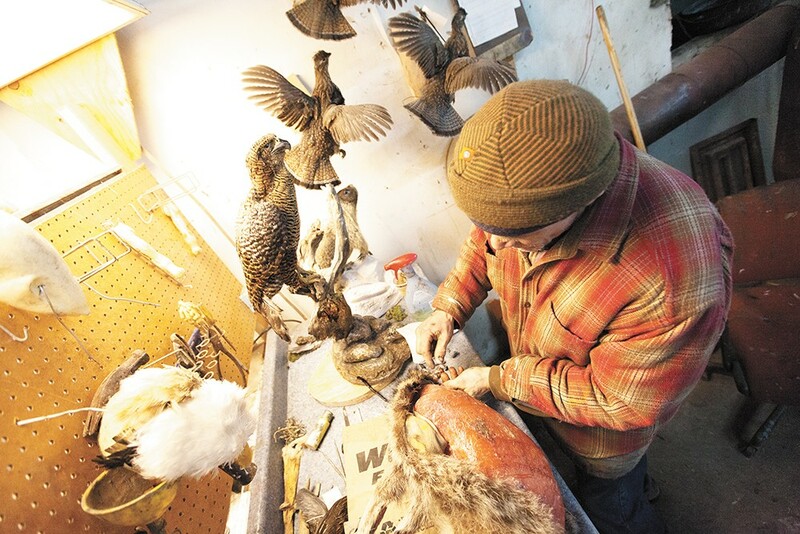 "It's a stinky business, it's dirty business, but it's kind of fun," says Dave Drury, the owner of Knopp Taxidermy in North Spokane. 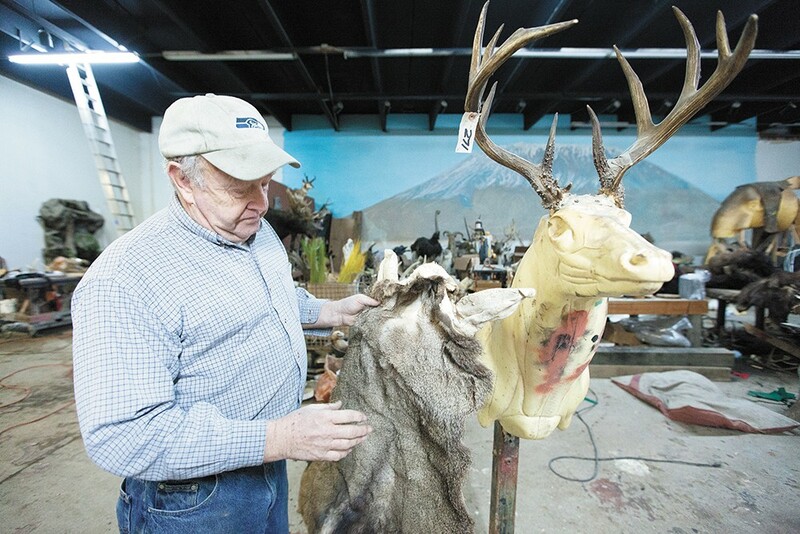 Dave Drury holds a tanned deer "cape" at Knopp Taxidermy. His father-in-law bought the business from brothers Walt and Jerry Knopp in 1978, back when the brothers operated a tannery on Division Street as well. In the 36 years that Drury has been in the business, not much has changed. He still uses the same German tanning formula the Knopp brothers developed — a mixture of salt, acids and oils, and the same cutting wheel to trim the fat off of thick-skinned hides. He still does his note-taking on 39-cent spiral notebooks and organizes his work orders on clipboards stacked on cabinet shelves. A thick, yellowed Rolodex of his suppliers sits on the left corner of his desk. A grimy computer chassis stands next to an old pricing poster on the floor. But the business of taxidermy has certainly evolved. The quality of the animals has gone downhill. Back then, hunters would bring in big trophy animals. Now the game is smaller, which means business is slower. When they first started, they would do more than 100 deer every hunting season. Today they do 50. "It's a dying art," he says. Last fall, a group of teenagers broke into his shop and stole more than $27,000 in taxidermied animals, including a full-size polar bear and a patas monkey. Drury laughs it off. He got all of his animals back, after all. "I was young once," he says. "I did stupid stuff." 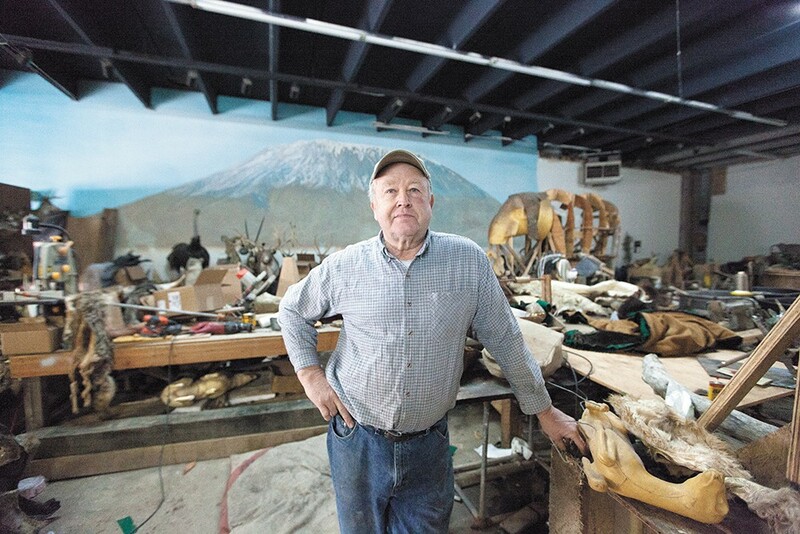 Drury is trying to retire from taxidermy and turn the business over to one of his sons. He works less than he used to, but puts in five days a week at his shop. He'll spend the rest of the summer working on a wildlife museum to teach children about animals — a decades-old dream of his. In his past life, he was a truck mechanic for Wonder Bread. But working on engine parts is nothing like this. He took basic biology in high school — that's it. Now he can identify an animal and pinpoint its age simply by examining its skull or the texture of its skin. He reaches inside a box and pulls out a swath of hippo hide. It's almost 2 inches thick. In life, it was a 9,000-pound, 5-foot-tall beast roaming the African grasslands and wading in swampy water. As a heap of leather, it's less than half its weight, but its skin is still rough and rubbery, like a truck tire.